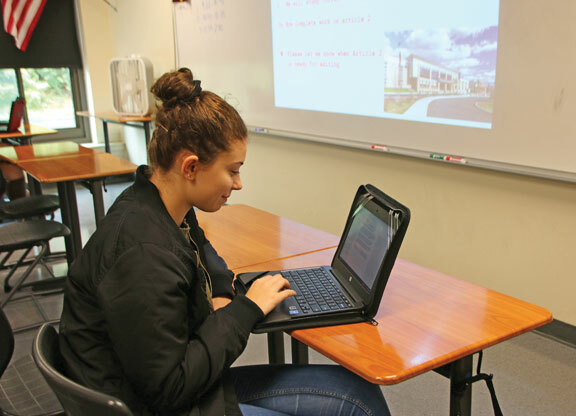 NAUGATUCK — The number of Chromebooks available to borough students has been growing over the past several years. It got to the point last year where administrators at Naugatuck High School had an epiphany. That’s what they did, and Naugatuck High rolled out its one-to-one program this school year. Under the program, each of the nearly 1,300 high school students received a Google Chromebook that will belong to them throughout their high school career. Students return their Chromebooks at the end of each school year, and the district fixes any normal wear and tear on the computers. Students are responsible for any damage above what is deemed normal wear and tear that was caused by negligence, according to Harris. Students are given the same device they turned in at the start of the following school year, under the program. “It creates a little bit more of a logistical headache for us. How do you make sure you collect all of them and give the same kid back the same Chromebook? But we thought that was going to create ownership over the device. So it would encourage kids to take a little better care of them knowing this is yours for four years,” Harris said. Once a student graduates that Chromebook is passed on to an incoming freshman at the start of the next school year, Harris said. A Chromebook is a laptop that runs Google’s Chrome operating system. Unlike most laptops, which store data on an internal hard drive, Chromebooks stores most of its data and applications to Google’s cloud storage. “With a laptop there are a lot of components that can wear out and break. With the Chromebooks, there are no moving parts, no hard drives or CD ROM drives,” Harris said. Although the one-to-one program is new this year, students have had access to Chromebooks. Previously, teachers had access to carts with 30 Chromebooks they could distribute to students to use in class. Harris said most of the Chromebooks went unused during a class because many classes don’t have 30 students. He added it took time for teachers to hand out and collect the devices. Since the school already had most of the Chromebooks it needed, Alan Merly, information technology director for the school district, said the only major costs to implement the program this year were protective cases for the devices and the software. Overall, it cost about $30,000 to fully implement the program this year, Merly said. The district paid for it with funds from the Universal Service Administrative Company’s Schools and Libraries (E-rate) Program and not the local budget, he said. Naugatuck High students aren’t the only ones with access to Chromebooks. Students in grades five through eight have their own Chromebooks to use while at school, but they can’t take them home, according to Merly. Teachers use the carts with Chromebooks at the elementary schools. The one-to-one program at Naugatuck High is working in conjunction with a program called “Off and Away,” which only allows students to use their cellphones during lunch or free periods. Harris said he used to be a proponent of students using cellphones in classrooms, but the Chromebooks are able to do everything a cellphone can do. “You think back six or seven years ago when the Chromebooks were in their infancy, the phones seemed like a really attractive option. But I think now, in terms a being able to produce, being able to collaborate, being able to share, the Chromebook and Google Suite far surpasses anything a student could do on their phone,” Harris said. Harris said the Chromebooks also have the added benefit of allowing the district to block access to certain sites, such as social media platforms. “Even if you could meaningfully write something on your phone, when your Snapchat is giving you a push notification every two minutes, that really interrupts what you are doing. Those kind of things don’t happen with the Chromebooks,” Harris said. Students have mixed feelings on the Chromebooks and that the school is using them instead of cellphones. Senior Alejandro Gabriel Rangel said he felt the Chromebooks don’t allow for as much collaboration as cellphones do. For senior Justes Cureton, the Chromebooks offer the ability to work on projects when she wants, without having to wait for a computer to be free. “I have a laptop at home, but because I have siblings sometimes it interferes with us both trying to do homework online. Since I have my own Chromebook, it is nice to use it on my own time so I am not worrying about my brother having to share with me,” Cureton said. Cureton said it also helps students and teachers stay organized. “I think it is easier because I can’t lose anything on my Chromebook. It is all right there. I used to lose papers a lot,” Cureton said. Harris said the program also has benefits beyond school. “We know that students have access to any kind of information they want via the internet. We also know that being able to be critical consumers of that information is a key skill in this day and age. So being able to have these devices and have that access every single day I think will promote those kinds of skills,” Harris said.